There are a number of beautiful bridges across the world. What that in mind, the Kinsol Trestle bridge stuns with its awe-inspiring height and spell-binding latticework design. Located on Vancouver Island, the soaring structure crosses the rushing Koksilah River in the Cowichan Valley. The bridge provides an overpass for cyclists, equestrians and hikers to cross the water and continue the Cowichan Valley Trail route. While noted for its beautiful architecture, the bridge is also the tallest free-standing wooden trestle bridge in the world. Towering 145 feet high above the water, it provides a breathtaking perspective of the ancient forest. At 614 feet long, it also grants visitors a long stroll in which to enjoy the panoramic vista. This timber railway bridge was completed in 1920 as part of the Trans Canada Trail! !Although not in use these days it is open to hikers and cyclists, offering great views of the Koksilah River! We loved this peaceful place and definitely recommend a visit if you’re in the area!! While the bridge’s construction began in 1911, it was taken over by he Canadian National Railways in 1918. In 1920, the bridge became part of the “Galloping Goose” rail line; however, the last time that a train passed the historic structure was in 1979. Following that crossing, the trestle was abandoned. Since then, it has became an Instagram sensation and local favourite. In 2006, the government announced plans to demolish it and replace it with another bridge. “That’s when Gordon Macdonald stepped in. Macdonald, CEO of Macdonald & Lawrence Timber Framing in Mill Bay, B.C., helped convince the government that the bridge could — and should — be saved. 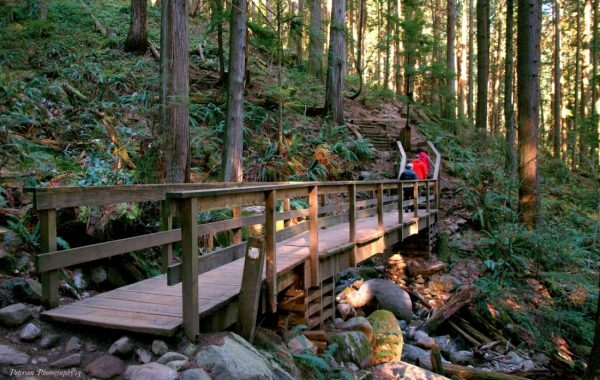 The process took about two and a half years and involved replacing unsound timbers and rebuilding 17 structural piers, but the bridge reopened in 2011 and is today a spectacular and popular feature of the trail,” cites Canadian Geographic. There are a number of other beautiful bridges in British Columbia. One of these is situated in the Fraser Canyon in the Alexandria Provincial Park, where its arching passageway is surrounded by lush greenery. There is also a breathtaking trestle bridge in Hope, BC. The Ladner Creek Trestle intimidates with its rustic architecture and sky-scraping height, and is also beloved on Instagram.